Formwork used in the construction industry must be designed, fabricated, erected, supported, braced and maintained so that it can support all vertical and horizontal loads that will be exerted. Here are the safety precautions to follow when dealing with formwork. Drawings or design plans should include all revisions for the jack layout, shoring equipment details, working decks, scaffolds, and all other related accessories. Once all those details are designed, shoring equipment must be inspected prior to erection to determine that the equipment meets the requirements specified in the formwork drawings. Do not use shoring equipment that is potentially damaged or shows signs of damage. All formwork shoring equipment must be inspected immediately prior to, during and immediately after concrete placement. Inspect all components thoroughly and if you find weakened equipment, reinforce it immediately. It is extremely important to check that all base plates, shore heads, extension devices, and screws are firm and secured with the foundation and the form. Adequately braced in two mutually perpendicular directions at the splicing level. Adjustment of single-post shores to raise formwork must not be made after the placement of concrete. 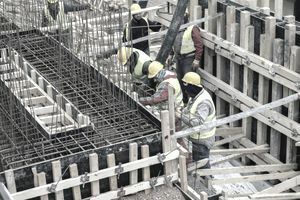 Reshoring must be erected, as the original forms and shores are removed, whenever the concrete is required to support loads in excess of its capacity. All vertical slip forms must be provided with scaffolds or work platforms where employees must work or pass. Reinforcing steel for walls, piers, columns and similar vertical structures must be adequately supported to prevent overturning and collapse. Employers must take measures to prevent unrolled wire mesh from recoiling. These measures may include, but are not limited to, securing each end of the roll or turning over the role. Do not remove forms and shores (except those that are used for slabs on grade and slip forms) until the worker determines that the concrete has gained sufficient strength to support its weight and superimposed loads. Verify concrete strength information against construction drawings, specifications, and testing results. Testing must follow the American Society for Testing and Materials (ASTM) standard test method designed to determine the concrete compressive strength, and results must indicate that the concrete has gained sufficient strength to support its weight and superimposed loads. Read all your contract technical information covering the procedures on how and when to remove the formwork.